Qlik Sense Enterprise 3.0 and the platform strategy dominates Qonnections 2016. Change lies ahead as analysis moves into the cloud. Qlik Sense 3.0 is coming in June, Qlik Sense Cloud is ramping up for wider use, and the Qlik DataMarket is gaining more powerful data-connection and data-enrichment capabilities. These were among the notable announcements at Qlik’s May 2-4 Qonnections event in Orlando, Fla.
Qlik has good reason for confidence coming out of Qonnections. Customers I spoke to now understand and accept the company’s platform approach, seeing both QlikView and Qlik Sense as here-to-stay components of a larger ecosystem. Instead of facing a forced migration to Qlik Sense – the company’s newer, more visual and self-service-oriented product – customers now trust that they will continue to have options and plenty of time to evolve their deployments as they see fit. At the same time they seem to accept that the bulk of Qlik’s investment is in Qlik Sense, which will see three updates per year versus one update per year for Qlik View. Analytics: Qlik Sense Enterprise 3.0, coming in June, will deliver visual search and exploration capabilities designed to enable business users to find new insights without requiring analysts to edit and modify visualizations and data. The update adds smart features, including automatic detection and charting of temporal (time-related) and geographic data. Developers will get new integration and visualization APIs as well as a plugin for Visual Studio. Data: Qlik announced the acquisition of partner Industrial CodeBox, a move that will turn that company’s QVSource product into a built-in tool for integrating cloud-based data sources such as SaaS applications and social networks with Qlik Sense and QlikView. QVSource has more than 40 pre-built connectors for popular Web-based sources including Twitter, Facebook, Microsoft Dynamics CRM, and SugarCRM. Qlik also announced Qlik DataMarket Financial Data Packages, due in June, offering licensable data on stocks, indices and corporate financials drawn from 35 exchanges around the globe. Cloud: Qlik introduced Qlik Sense Cloud last year with a basic freemium service for personal use. Qlik Sense Cloud Plus, added in January and priced at $20 per user, per month, offers secure sharing of analyses among small workgroups. Qlik Sense Cloud Business, announced at Qonnections and due out in the second half of this year, will support secure sharing of analyses with internal and external groups. It’s aimed at departments of larger businesses and small and midsized enterprises and is offered through monthly and annual contracts. I’m most impressed by Qlik’s data investments. A keynote demo of a new Visual Data Preparation tool due out with the June 3.0 release brought rousing applause from customers. The tool lets you upload and explore data sets, which are shown as visual bubbles on a palate. Related data sets automatically show up in close proximity, and joins are as simple as inspecting the data and pulling the bubbles together. The new data-prep interface targets spreadsheet-savvy business users. It stops short of the munging, mashup and transformation capabilities offered by Qlik partners such as Alteryx, Informatica, Paxata, and Trifacta, Hjalmar Gislason, Qlik’s VP of data, told me. But I think Qlik is delivering the basics that are most in demand. I also liked the Industrial CodeBox acquisition, a tuck-in deal that enhances the power of the budding Qlik DataMarket. CodeBox provides data-connection and data-enrichment options that will only see more use as data is increasingly born in the cloud and as digital businesses move toward blending and monetizing information through cloud data services. 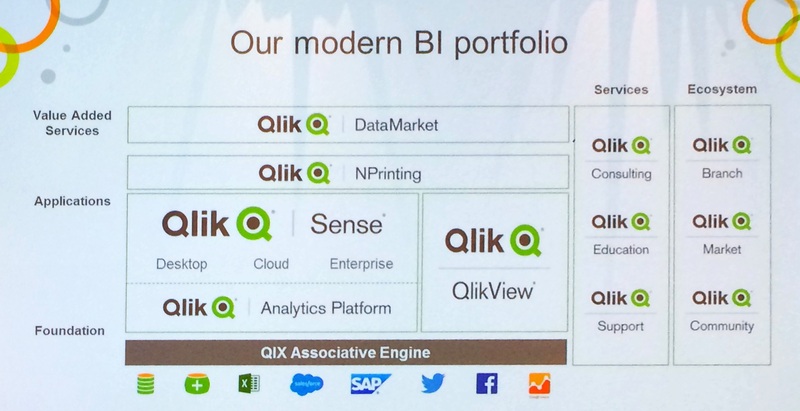 What I’m less impressed with is Qlik’s methodical, bottom-up move to the cloud. Qlik was late to the game when it launched Qlik Sense Cloud last year, and the strategy is to move up from personal and workgroup use to departments and SMBs later this year. Qlik Sense Cloud Enterprise edition won’t show up until sometime in 2017. Qlik Sense Cloud runs on Amazon Web Services, but we’ve seen no detail on how it might access AWS data sources and cloud services. Yes, we agree with Qlik’s argument that it’s going to be a hybrid world for a long time to come. But in our research and advisory work, Constellation Research sees demand for cloud-based analytical capabilities from companies large and small. In fact, we think digital disruption is bringing an era in which the majority of information deemed critical will be accessed externally rather than owned and managed on premises. Amazon Web Services, Google and Microsoft are building out extensive portfolios of analytical capabilities complementing their massive public clouds. They know that getting the data into the cloud is just the first step. The next step is taking advantage of data scale and massive compute power to harness automation, machine learning and artificial intelligence capabilities that will gradually take some (though certainly not all) of the labor and complexity out of data management and data analysis. In the future (how near isn’t quite clear), these sorts of features promise to transform our ideas of ease of use and change the BI and analytics battle from self-service to smart cloud services. With a cloudier approach and more partnering, Qlik could be leading the way. SAS Goes Cloud, But Will Customers Follow? Previous SAS Goes Cloud, But Will Customers Follow?